We've decided that either Oaxaca has managed to get its tourism mix just right, and/or that we are the tourist demographic they're aiming for. 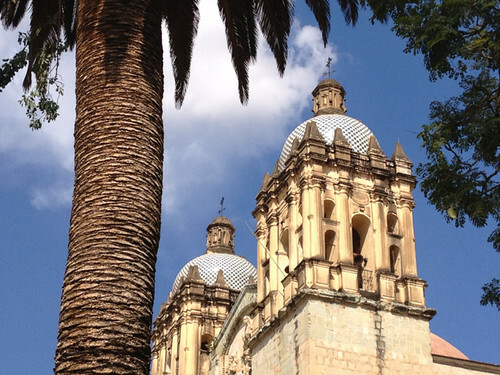 Oaxaca attracts just enough tourists so that the facilities and services you need as a tourist are available (information, easily accessible day tours, a range of different foods) but not so many that you feel as if the tourists have swamped daily life for the locals. 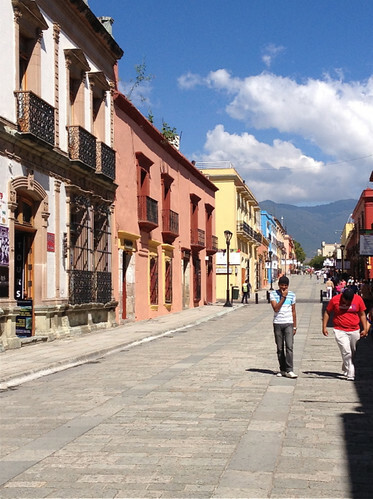 So what did we find so attractive about Oaxaca? 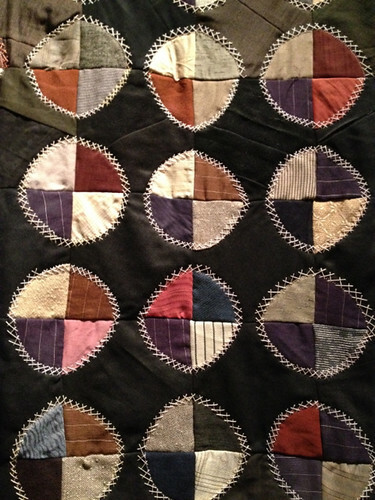 Of course there were the textiles of the last post, and the opportunities for wonderful shopping they provided. Top of the list, absolutely. But there were other attractions. First, the charming streetscapes. 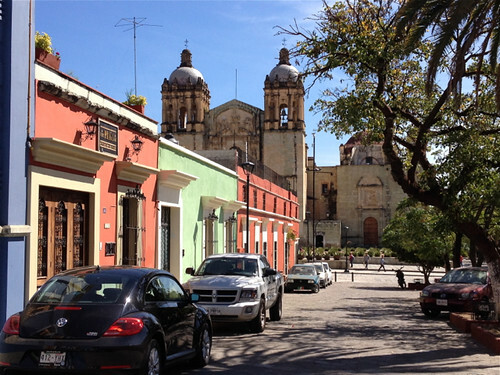 Oaxaca is a low-rise town. As for medieval cities in Europe, the highest structures are the steeples of the churches. Few buildings are higher than two storeys, so the streets have a regularity of scale that's pleasing and very human. Then there's the colour. While there are a few grander buildings in rather austere stone, most of the buildings are painted in colours it would be impossible to replicate in other contexts - soft orange, sky blue, occasionally pistachio green, and my favourite, a golden, mustardy yellow. 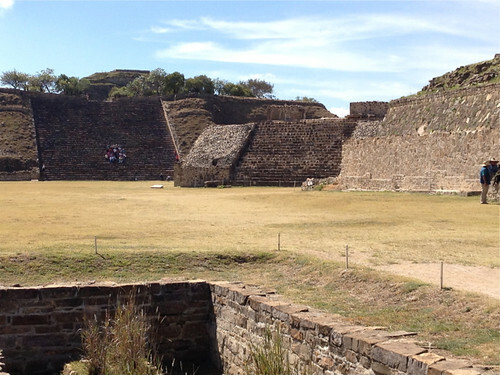 Secondly, if you're interested in, but not obsessive about archeological sites, the splendid Monte Alban is only a twenty minute drive from the centre of Oaxaca. There's more than enough history, myth, grandeur and the sense of a lost civilization to keep you deeply interested for hours, without leaving you overwhelmed. 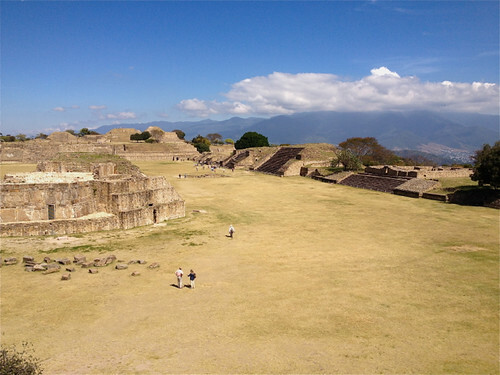 Monte Alban was the foremost centre for Zapotec politics, society and economy for close to a thousand years, from around 500BC to 600AD when the habitation of the site petered out. A hilltop was levelled to create a grand plaza - about 200 x 300 metres in size - and then surrounded by pyramidal buildings with different ritual or social purposes. As always with such evidence of past grandeur you are struck by the skill, strength and sheer hard labour that were needed to achieve such an impressive structure with only the most basic construction technologies. 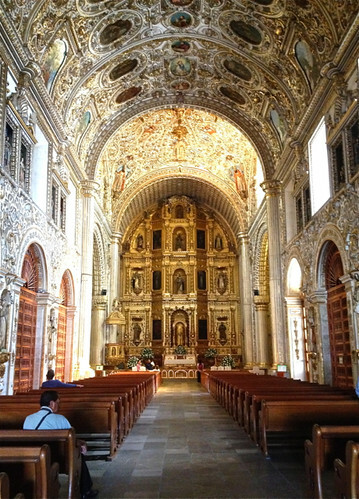 Third, if you are a fancier of old churches, Oaxaca will satisfy your fancies. At almost every corner there is a glimpse of steeples or church roofs with colourful tiled domes. The churches are still in use - we happened upon a christening in the Rosary Chapel, and an ongoing mass in another church I visited - and they are clearly cared for and valued (though there are reports of gold and other effects being stolen in recent years). 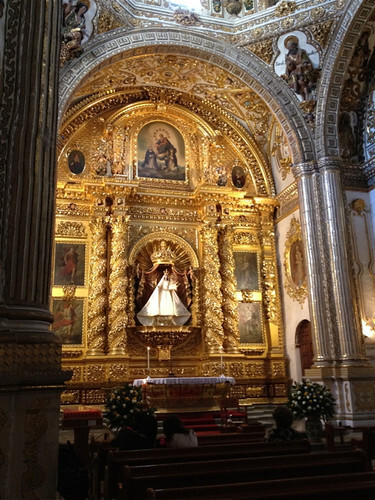 But the catholic church in Mexico is quite separate from the state and I was left with the impression that religion is a private affair and the churches are seen equally as part of their heritage as they are places of worship. Fourth, there are some interesting museums, if you're a museum fan. 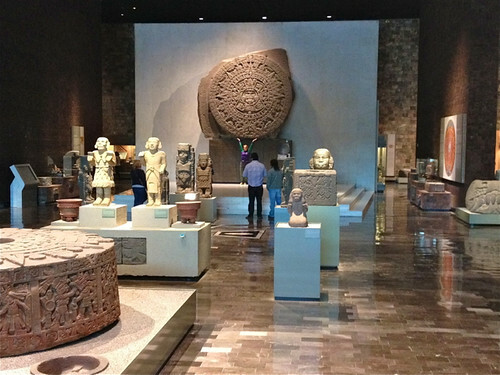 We'd had rather a museum splurge in Mexico City and missed some of the recommended Oaxaca museums. But apart from the inspirational textile museum of the last post, we visited the Museum of Contemporary Art that displays exhibitions by well-known local artists. It's located in one of the grand old buildings of courtyards and colonnades and balconies, with rooms opening one into another to provide views of how the works you've just seen relate to those still to come. When the old building was adapted to its new purpose the painted decoration around some of the doors was preserved so that you are reminded that the building had had a history other than the spare, contemplative spaces that now exist. 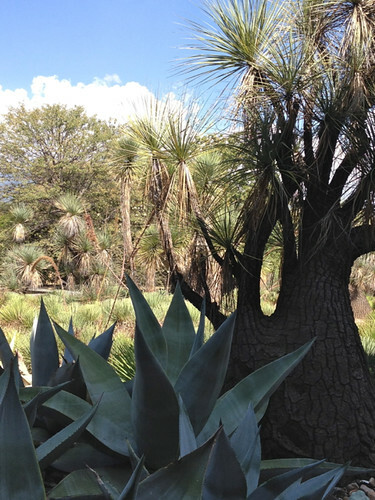 The Jardin Etnobotanico was a different kind of museum. 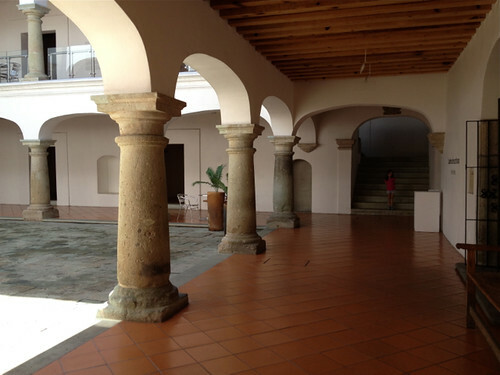 The space and buildings that are now a large garden had originally been the monastery for the Templo Santo Domingo and then, in the nineteenth century, a barracks and parade ground for the military. 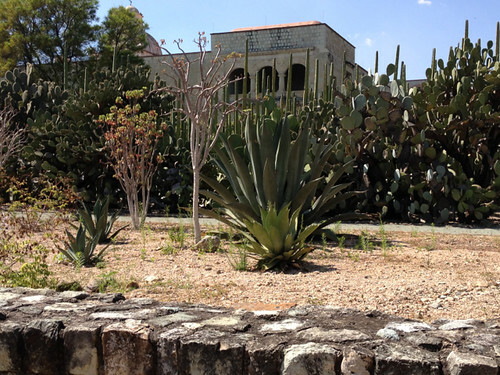 In the early 1990s there were plans to convert the space to a luxury hotel, but some of the famous local artists led a successful campaign to create a special kind of botanical garden - one that focuses on the plants of the Oaxaca region. The garden is now almost twenty years old and apart from being beautiful, it's fascinating, with special sections for plants for medicinal use, for food, for dyeing and other practical uses. And the fifth and final reason - the food. Yum. I thought I wasn't a great fan of Mexican food, but clearly my exposure to it had been very limited. Between recommendations from a colleague of my daughter, and a remarkably well-informed edition of the Lonely Planet we had some wonderful meals (and drinks). 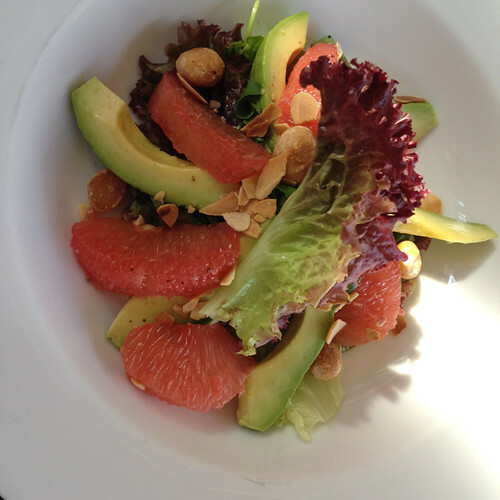 The restaurants we tried used local foods in modern ways. 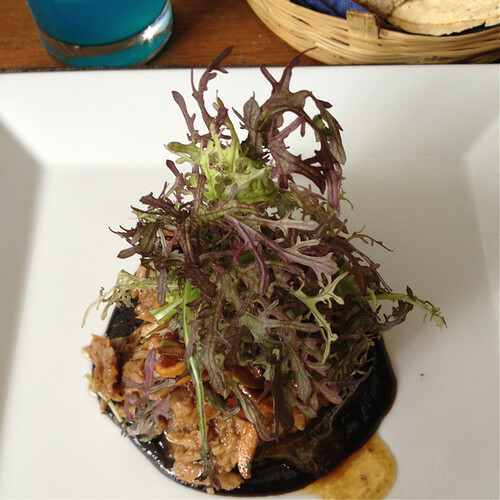 We had lots of mole sauces (the traditional bitter-chocolate based sauces that in Oaxaca come in black, red or yellow versions); beautifully soft, slow-cooked pork; local herbs; and the inevitable tortilla based accompaniments, including the blue tortillas topped with soft local cheese in the bottom left-hand photo. 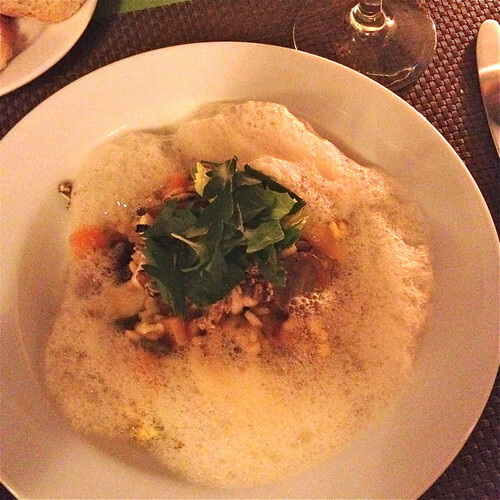 I even had risotto topped with foam! The risotto, by the way was wonderful with pumpkin, pumpkin flowers and caramelised pumpkin seeds. Clearly, we've enjoyed our visit to Oaxaca. Wonderful. Highly recommended. 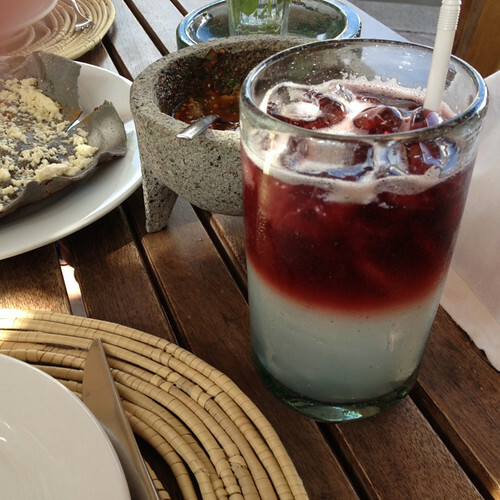 We've had almost a week in Oaxaca in the south of Mexico. 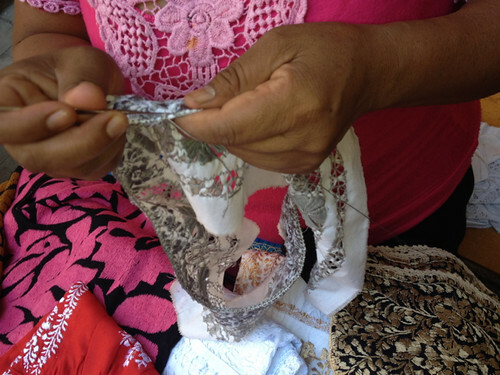 Oaxaca is heaven for textile fanciers. 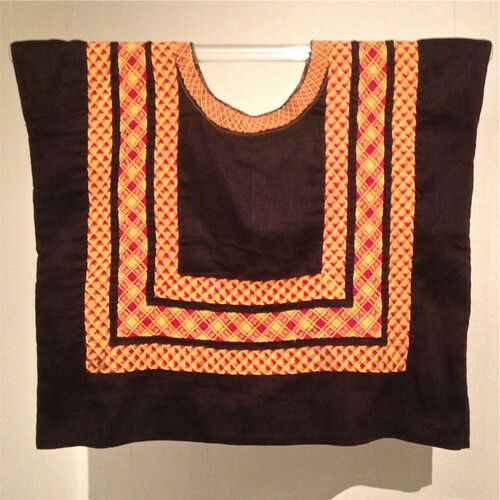 Everywhere you turn there are beautiful textiles to lure you - people wearing them, shops and markets selling them, hawkers showing them, and museums displaying them. 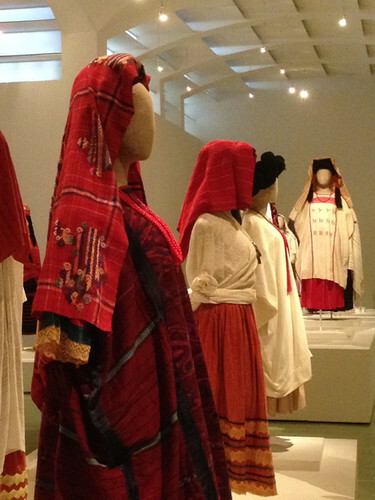 We began by visiting the Museo de Textil de Oaxaca to get an idea of the traditions of the region. 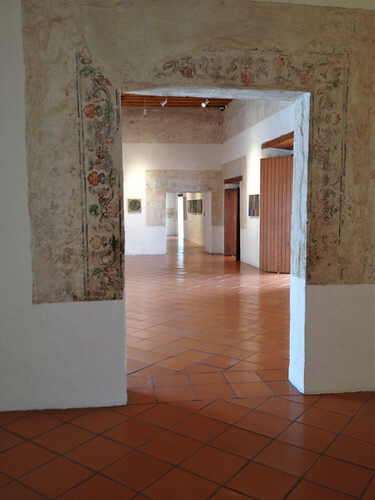 It's a relatively small museum in an elegantly restored colonial building. Over our visit I was delighted by the way the street facades of these old buildings open to tranquil courtyard spaces - but that's another story. 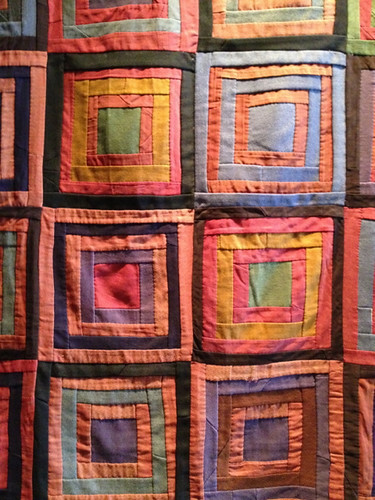 The museum displays only part of its collection at any one time, but displays it beautifully. There's much to examine and admire. 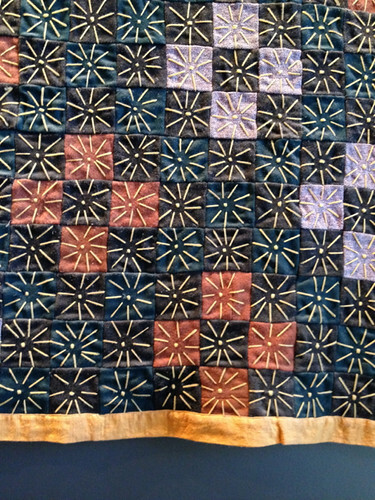 All the older textiles, and many of the modern ones are hand-woven, using either backstrap or pedal looms depending on the outcome that's needed. 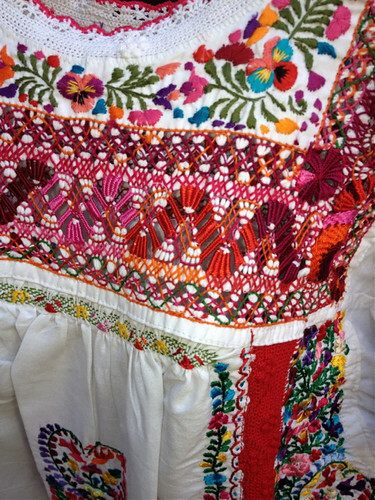 Often the fabrics are then elaborately hand-embroidered. 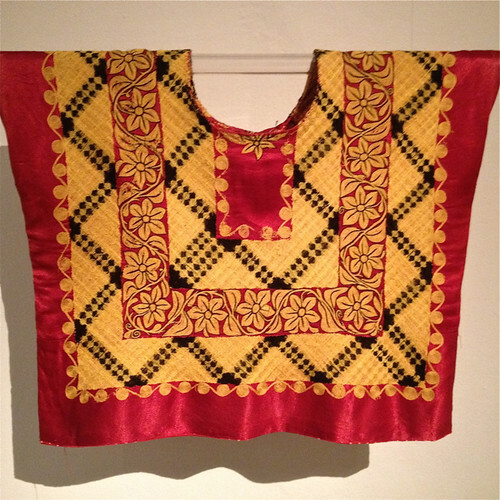 An earthy red colour predominates in the fabrics that originally, and still sometimes today, are dyed with cochineal - the tiny beetle that produces the deep red dye that was so desired and traded during the colonial period and brought much wealth to this area. 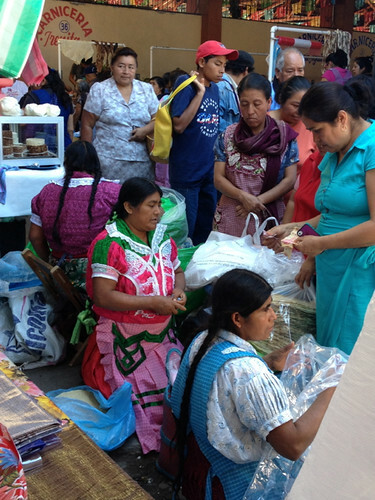 We went to a huge local market in the village of Tlacolula; the kind of market where you could have bought almost anything you wanted or needed - fruit and veg, meat and fish, hardware, underclothes, children's toys, cups of the delicious local hot chocolate (yum). 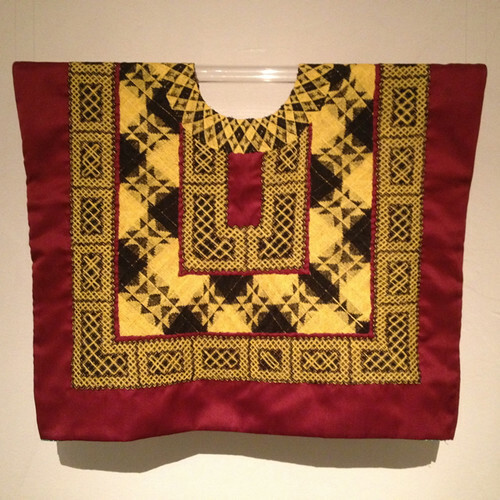 Many of the women traders were dressed in local style - brightly coloured longish pleated or gathered skirts, often in shiny fabrics, a blouse with puffed sleeves and a lace collar, an apron decorated with embroidery, and a reboso. Many had their long plaits intertwined with ribbons. 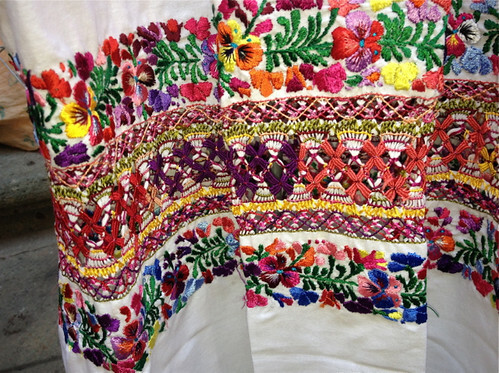 A cross-street of the market was lined with stalls selling woven and embroidered huipils, blouses and dresses. Even though the quality was not as fine as the work we saw in the Museum and the Museum shop, it was still of good quality and the riotousness and inventiveness of the colour combinations was astonishing. 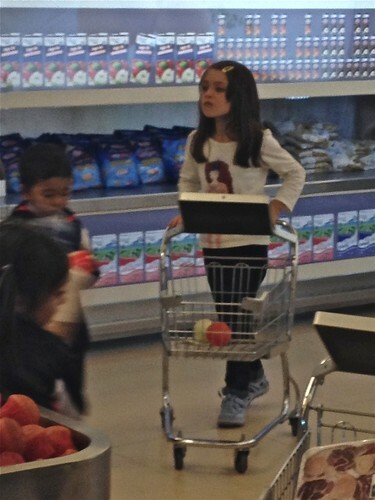 There were also amazing bargains to be had. 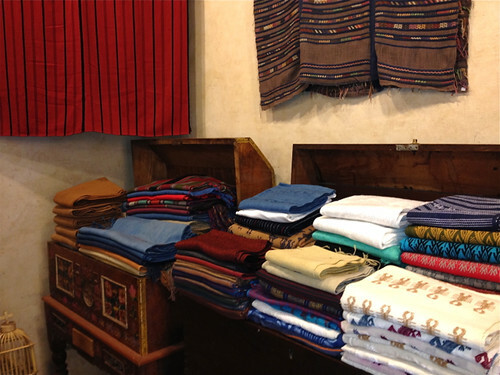 In town there are shops selling handcrafts on almost every corner - grey pottery characteristic of the area, tinware, brightly coloured wooden fantasy animals (alebrijes), and of course the woven and embroidered textiles and clothes. One day we happened upon a group of older women selling their work in the entrance to the public library. It was at another level of excellence altogether. Some of the higher end shops in town displayed their work like cameos of loveliness. Of course it helps if the store is located in a restored colonial building and you have antique furniture in which to store and display it. The shop in the photo above specialised in weaving, rather than embroidery. 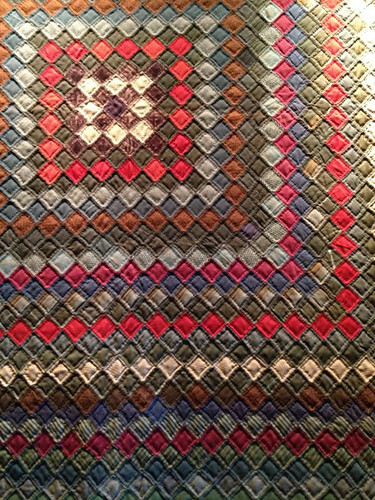 I was astonished at the variety of the hand-weaving techniques still practised and available for sale. 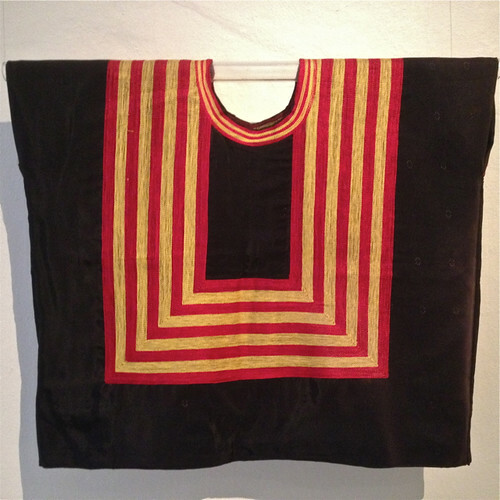 Where it's appropriate, some of the fabrics are still made using back-strap looms and then the narrow strips of fabric are sewn together with decorative stitching to produce huipils or ponchos. Oh, and I forgot to mention the rugs and carpets, often dyed with the natural dyes that are so characteristic of this region. 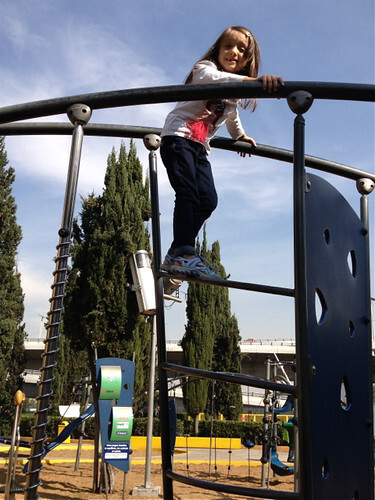 Mexico City is a good place to visit with children. 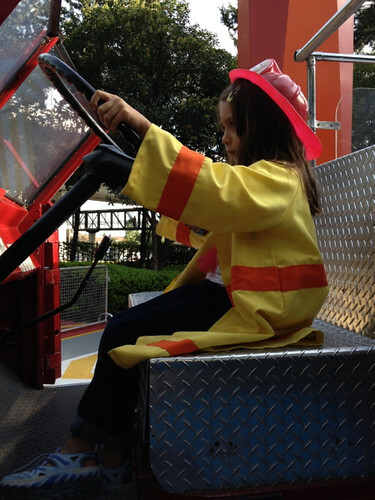 They are welcomed in most places; indeed, often given special attention, and there are many activities to naturally attract and engage them, such as the colourful street parade of the last post, or the weekend buzz of squares and plazas such as that at Coyoacan. 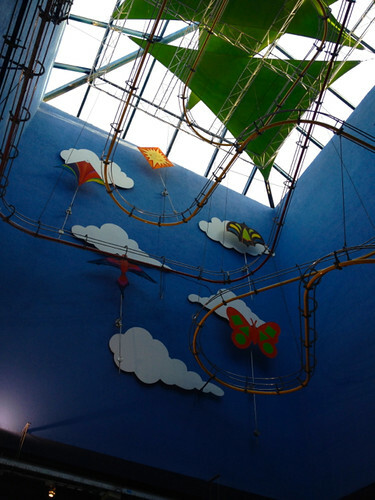 The Papalote (which translates as 'kite') is enormous and has activities for children of all ages. It's broadly arranged around themes that managed to escape us as we moved from one exciting activity to the other. There are young, enthusiastic attendants everywhere to help and gently supervise - though our lack of Spanish sometimes was a bit of a challenge for them, and us! 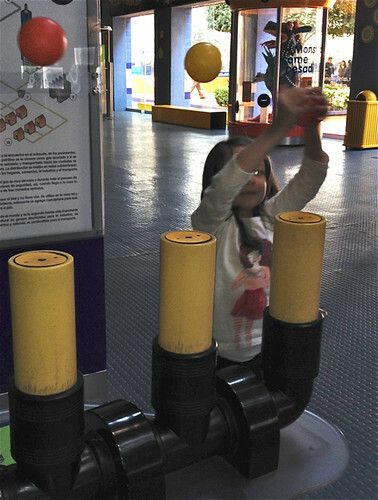 There are activities that demonstrate scientific principles in fun ways; lots of imaginative games such as riding in a fire engine or shopping in a most realistically recreated supermarket(though here there was also 'educational value' as the children had to find items across the food groups before they could shop freely); telephones that enabled you to dial cities around the world to hear greetings in their languages, as the city lit up on a giant globe; adventurous and challenging outdoor playgrounds designed for children of various ages; lots of lego, colouring in, an IMAX theatre, even a bed of nails - the list just goes on and on. We were there for hours. As usual, I've somehow managed to take photographs that make it appear as if we were the only visitors to the museum. That's far from the truth. It was a school day and there were lots of school groups visiting - often tiny uniformed children with their teachers - and later in the day (it was late closing) informal groups of adolescents began to arrive. Incidentally, on our first attempt to visit the museum we were turned away as the museum was closed for a visit by Crown Prince Frederick and our Mary of Denmark. Those Danish royals really do get around. I couldn't help thinking it would have been so much more interesting for them to see the museum buzzing with excited children as it was when we visited. 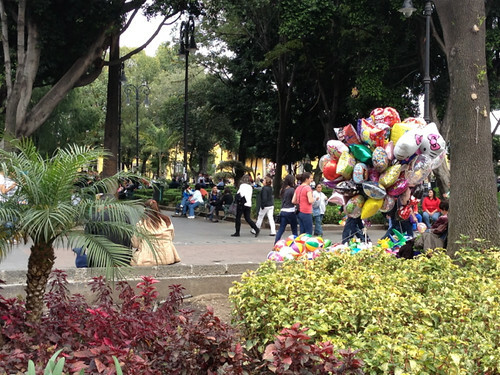 I'm finding it difficult to know what to write about our week in Mexico City. 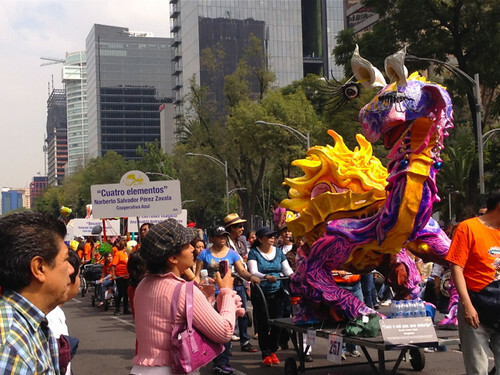 Like Beijing, Mexico City overwhelms you. It's geographically vast, sprawling densely across mountainsides and valleys at an altitude of over 2,200 metres. It leaves you slightly breathless, literally. It's crowded with people - depending on how you measure populations, more than 20 million of them in Greater Mexico City - so getting around can be a series of challenges. It has wide-spread and well-developed transport systems, though they're often very crowded and require local knowledge to negotiate. There's so much to be commented on, but my knowledge is so shallow that I feel rather intimidated. But as I keep telling myself, my blog is for myself, as much as it is for others, so I want to record some impressions. It was interesting coming to Mexico after visiting the USA, where I'd seen the wonderful results of philanthropy in action in the artistic and cultural worlds; the Walt Disney Centre for the Performing Arts in LA, the Nasher Sculpture Centre in Dallas, LACMA, to name just a few. In Mexico City it seems that the role of promoting the cultural life of the city, and the country more generally, had been taken on by the state. (As an aside, it seems to me that we in Australia fall very much between two stools in this regard - neither the state nor philanthropists consistently act to promote our cultural life.) In addition, in Mexico City there seems to be a desire to make art accessible to the people, and to encourage thinking about national identity through public and popular structures and events. The second level of the Museum displays how people of the various regions live today, with the current-day practices located directly above those of their ancestors. 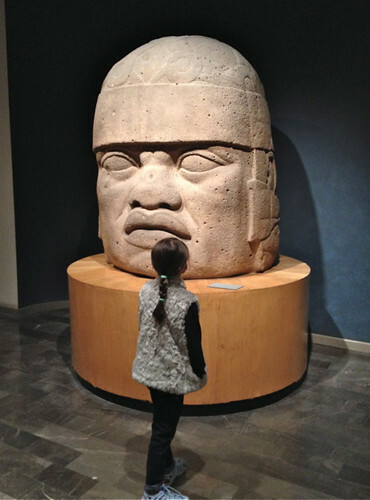 We had limited time and energy, but explored the display from the southern Oaxaca region where we planned to visit. 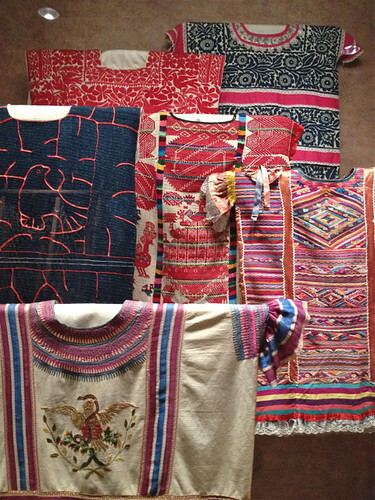 Oaxaca is also the region with the richest textile tradition - a predictable reason for me to visit! 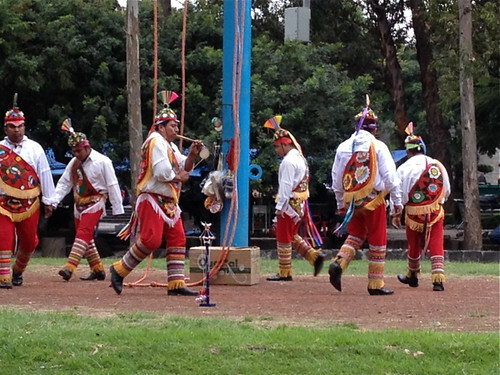 In a clearing outside the Museum is a display of the Totonic 'voladores' (flying) rite. 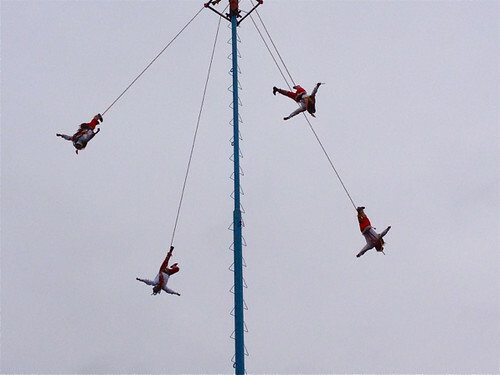 The voladores circle a 20 metre high pole, chanting to drums and a pipe. Five of them then climb the pole and while one sits at the top, playing drums and pipe, the others gradually 'fly' in circles, upside down, hanging by one ankle, as ropes release them from the top to the bottom of the pole. It's a ritual that you almost can't watch as their strength and bravery are tested. 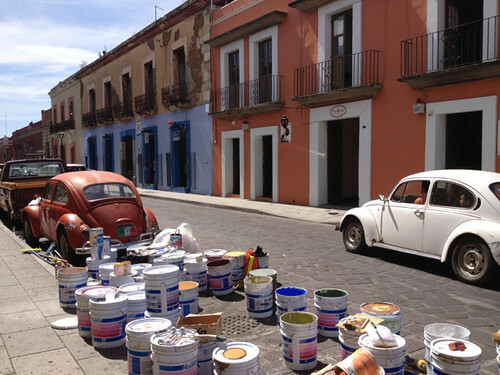 Mexico has a long-established tradition of using murals in public spaces to inform and educate its people. In the twentieth century this tradition has been used to reinforce Mexican identity, but has also resulted in grand, publicly accessible works of art. 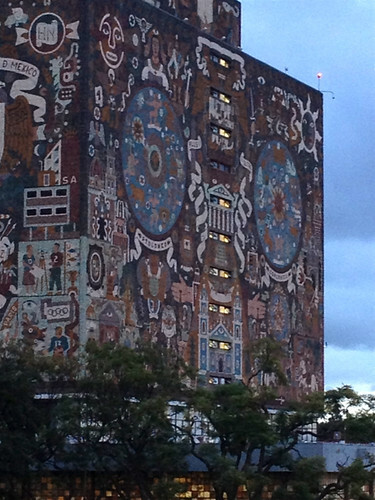 We visited the campus of the Universidad Nacional Autonoma de Mexico (UNAM) where the Central Library, is a ten-story artistic creation, depicting the history of Mexico from pre-hispanic times. The whole building is covered with mosaic stone murals designed and created around 1950 by artist Juan O'Gorman. All the mosaic stone tiles are in their natural colours - sourced from all around Mexico. 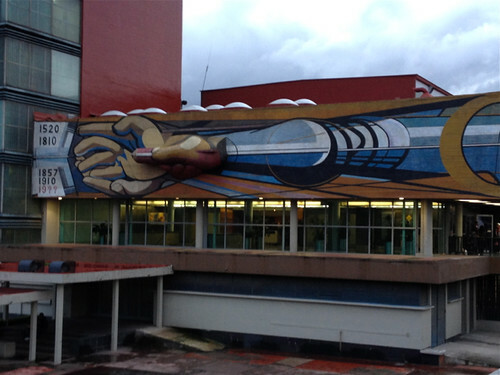 The Library, together with other university buildings, such as the Rectory, with its 3D murals by renowned artist Siqueiros showing the people urging the students to reform and advance the country, have been declared a UNESCO World Heritage site. UNAM, by the way, was established in the sixteenth century, has over 300,000 students, has negligible fees, and has highly selective entry. 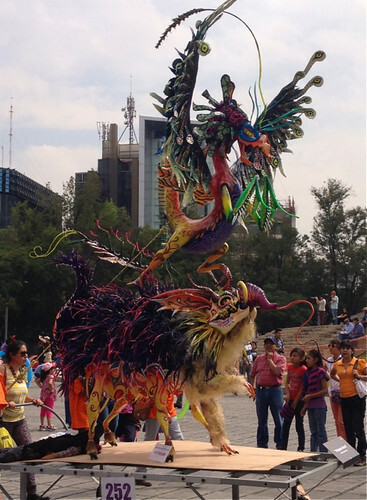 One day we were delighted to happen upon a street parade of colourful, fantastic creatures advancing along nearby Reforma - one of the grand central avenues of Mexico City. The city was promoting what we assumed was a competitive display of the creative imagination and skill of various local groups and associations. Giant versions of alebrijes, colourful ceramic figures of fantastic animals, insects and birds, had been recreated from papier mache, feathers, and fabrics and mounted on hand-pulled carts. Some had articulated limbs and many were guided by their handlers with swooping, dancing movements into the watching crowd. The parade went on and on. There must have been at least 40 of these wonderful creations advancing along the street. A couple of days later we saw that they had been grouped along the broad median strip of another street for passers-by to continue to enjoy the spectacle. Maybe I'm romanticising what we saw, but this colourful parade seemed to be yet another public promotion of popular art to emphasise Mexican identity and traditions. Frida Kahlo was an artist who painted from the 1920s to the 1950s and is now an international icon whose image is emblazoned on tee-shirts and handbags around the world. Many of her works are colourful, naive, often horrifying self-portraits. Over more recent years she has become a public symbol of much that is essentially Mexican, dressing in colourful clothes and exotic jewellery drawn from indigenous traditions, personally presenting an image of female beauty that is distinct from European traditions, and painting a combination of suffering and celebration that seems distinctively Mexican. Kahlo also had links with many of the world revolutionary figures of the time, and saw no contradiction between advancing Mexican identity and promoting international socialism. 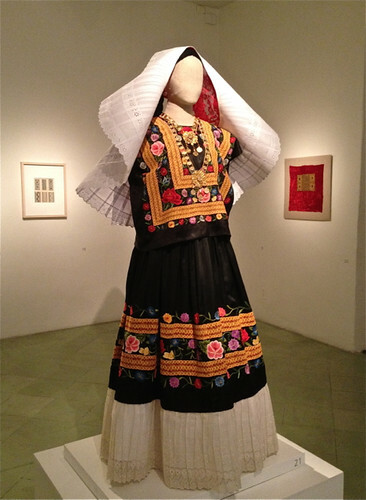 We, like many other tourists, visited the Museo Frida Kahlo in Coyoacan. Frida Kahlo was born, worked in, and died in the 'blue house' that now houses the museum. The museum has a small selection of her paintings, with a focus on early portraits of her family and friends. 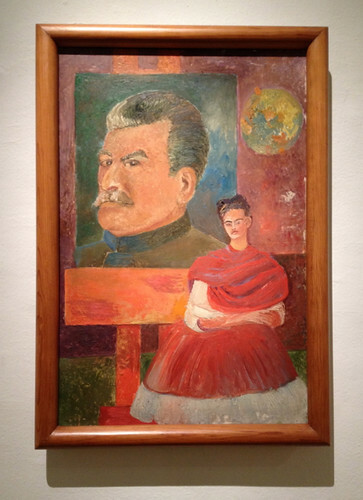 I was rather taken by 'Frida and Stalin', where Stalin and the objective of world revolution loom over a stationary figure of Frida. 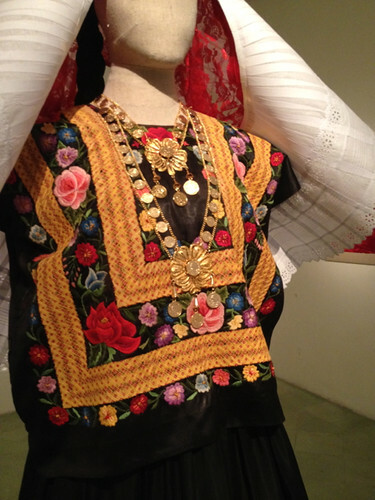 Some parts of the museum attempt to recreate Frida's life in the house. 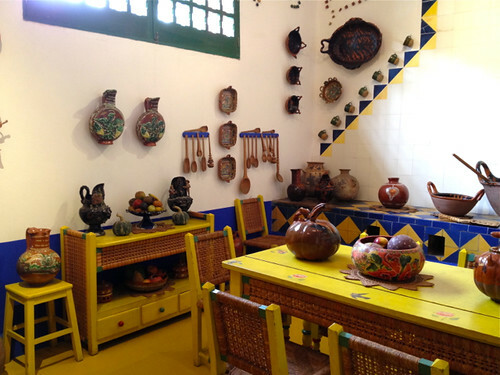 The dining room and kitchen, with their distinctive Mexican colours and display of pottery and other artifacts, including the skeletons so central to Mexican iconography, reveal Kahlo's immersion in Mexican craft traditions (though you can't help feeling everything is much cleaner and neater than it would have been in Frida's time). 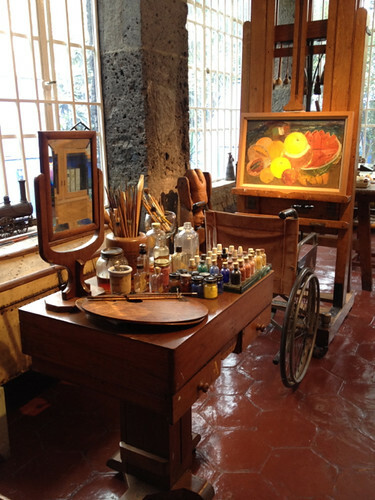 Upstairs, Kahlo's studio, with the wheelchair that she used for much of her life, is particularly poignant. Mexico City is a bustling, crowded, international city. But it's also a city where you can't linger long without becoming aware of its very distinct national identity and of the many and varied ways in which that identity is promoted by the state through its art and craft traditions. In San Antonio I stayed in the Riverwalk Vista, which I realised only after I arrived was an 'Historic Hotel of America'. It wasn't a grand hotel; in fact they called themselves an inn. The building dated from the 1880s when it had been built as a large general store. 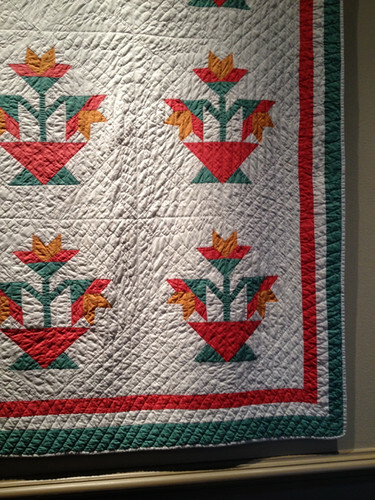 I enjoyed my stay, but what probably predisposed me most to think it was a good place to stay were the quilts that decorated the hallways and public spaces. 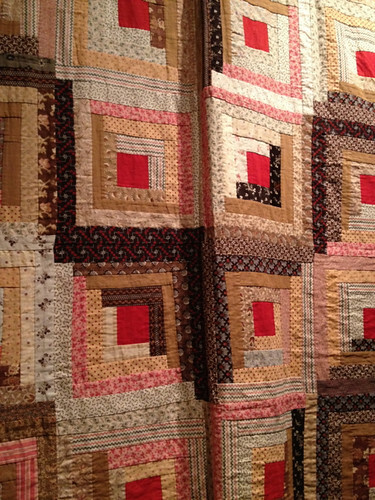 Every time I walked along the hallway I had to stop and admire and examine and envy the quilts.